So you’ve booked your trip to Barcelona, Spain. 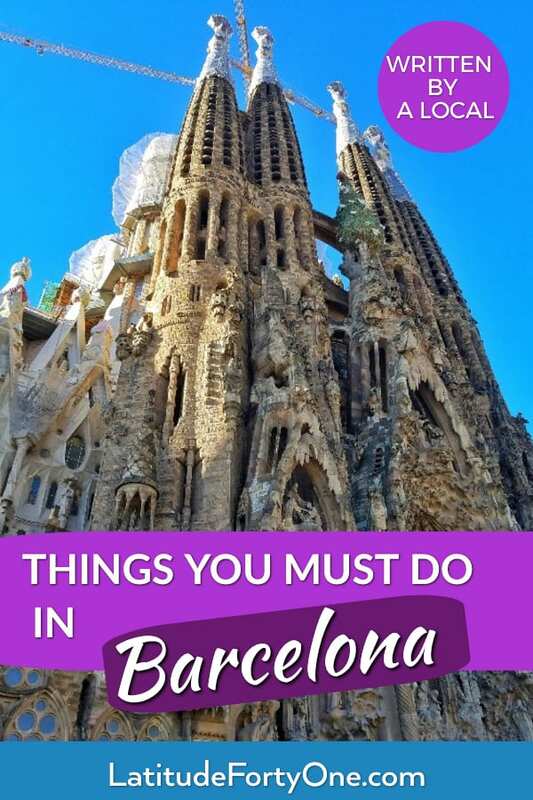 And now you have approximately 381 Barcelona pins on your Pinterest board called “Barcelona: trip of a lifetime”. Where to start? 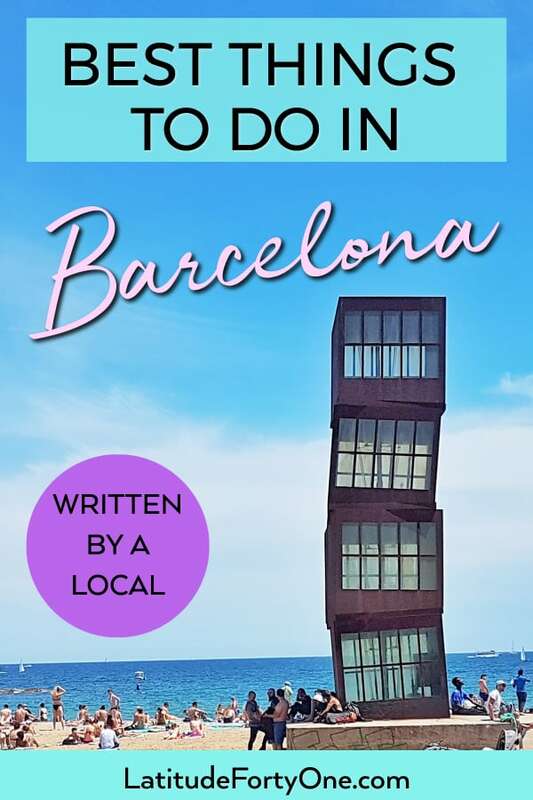 What’s are the must-dos in Barcelona? What’s the meaning of life? Relax, relax, I’m here to solve your existential problems. 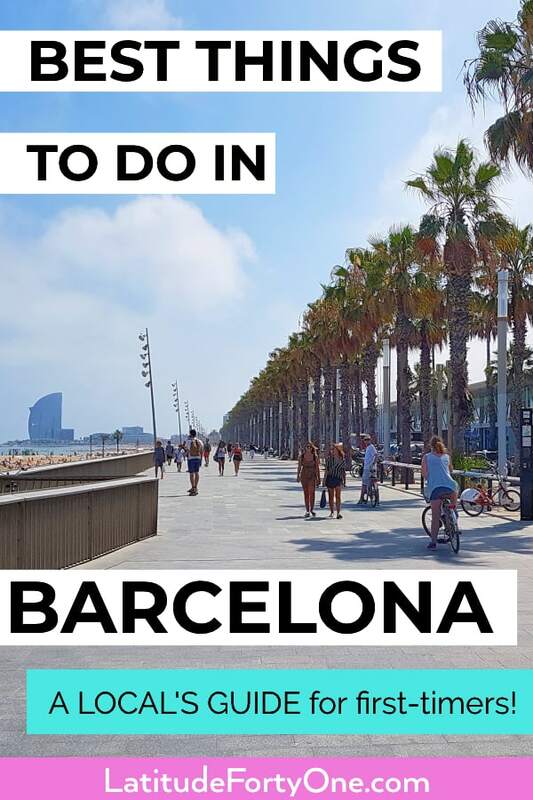 So if you only have a few days, I’m sharing my Barcelona insider tips on where to go in Barcelona. 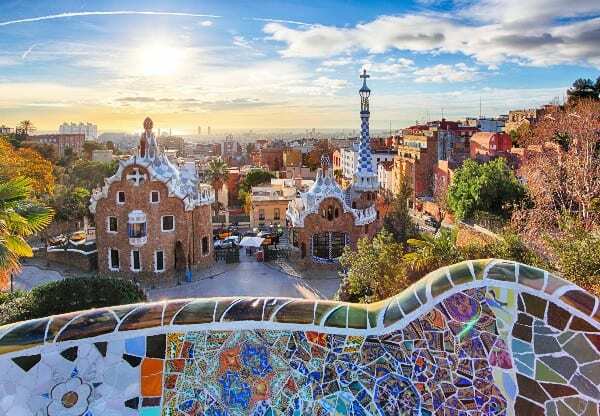 As one of the top European destinations, the city is saturated with landmarks – that it’s hard to narrow down what to do in Barcelona in a short amount of time. Historic monuments, scrumptious tapas, and Instagrammable rooftop views, gah! You can have it all, my friend. 1. 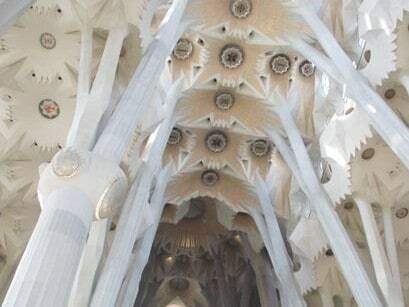 Go inside the incredible Sagrada Familia. 2. Wander the ancient streets of the Gothic Quarter and Born neighborhoods. 3. Walk down Las Ramblas. 4. Visit a local food market. 5. Check out the colorful Park Guell. 6. Check out Barcelona’s seaside area and beachfront. 7. Walk down Passeig de Gracia to see Casa Batlló and La Pedrera. 8. 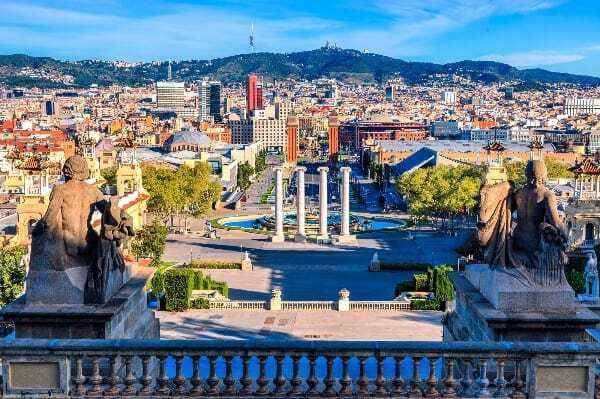 Visit Montjuic and get a panoramic view of Barcelona. 9. 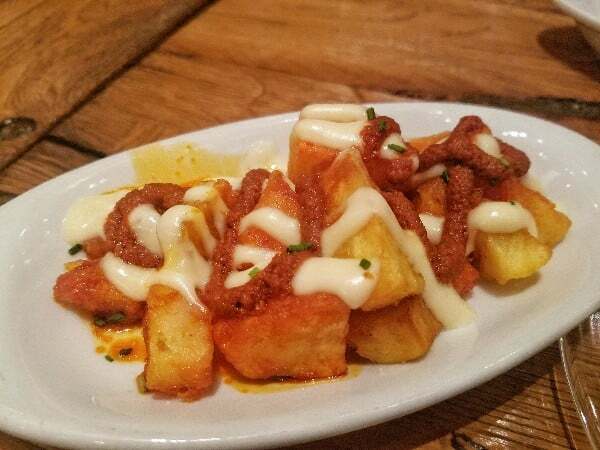 Eat like a local and have Catalan food. 10. Have some oozing hot chocolate con churros. If you have a short amount of time (less than 3 days), stick to attractions around the city center so you can enjoy Barcelona and be less stress-free. If you have longer than 3 days, try the Park del Laberinth, or a day trip like Montserrat, or Sitges. This spectacular basilica the hands-down, number one must-do in Barcelona. 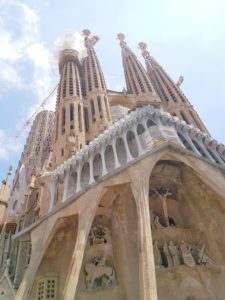 As you may know, the Sagrada Familia is a work in progress. 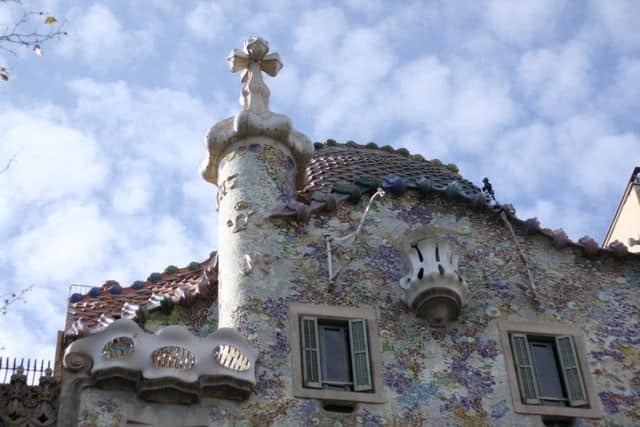 And it’s expected to be completed in 2026, the 100th-year death anniversary of its famous architect, Antoni Gaudí. Its unconventional church façades leave visitors curious to see its extraordinary interior as well. The Sagrada Familia: Add this to your Barcelona must-see list, or die unhappy. 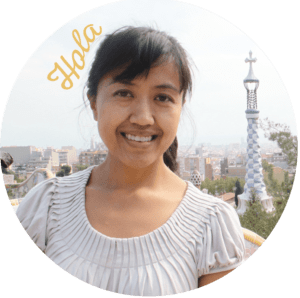 When you visit the Sagrada Familia, it’s helpful to purchase use of the audioguide, as you’ll learn the fascinating history and now how each aesthetic detail of the basilica is intentional and symbolic. In other words, it doesn’t bore you with cryptic-sounding historical facts! (Is that just me?) If you have extra euros to splurge, a guided tour would probably be best as there are so many intriguing details! To NOT visit the Sagrada Familia – or, at the least, see it on the outside – is, to me, the gravest Barcelona tourist sin you can commit. The Ciutat Villa is the oldest, central part of Barcelona, and this large area captures the contrasting energy of Barcelona: ancient and vibrant. The Ciutat Vella, is one the top places to visit in Barcelona for its narrow streets, grey medieval facades, and idyllic plazas. Note: be prepared for crowds! Pass by the Gothic masterpiece, the Barcelona Cathedral, which opens to Plaça de la Seu. Stop at the Plaça del Rei, where Queen Isabel and King Ferdinand held court. Breeze by the Plaça de Sant Jaume and see the neoclassic buildings of the Barcelona City Council and Palau de La Generalitat. Sweep through the ancient street, Carrer Bisbe, the old Roman street. 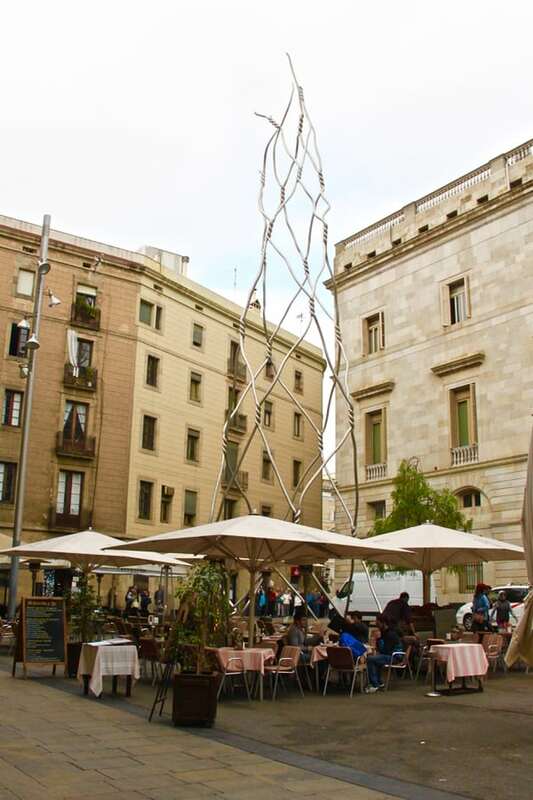 Pass by the Picasso Museum on Carrer Montcada. If you go inside, it might be hard to find any recognizable works – as its sketches and artwork during Pablo Picasso’s early formative years. Don’t forget to see the somber and mysterious Santa Maria del Mar cathedral, an emblem of Catalan Gothic architecture. While I wouldn’t say this Barcelona attraction is a breathtaking place, it’s so historic and iconic that you couldn’t leave without seeing it. It’s the main artery of Barcelona that was built between the 15th and 16th centuries and divides the Raval and Gothic Quarter neighborhoods. It’s also a wild open-air museum — you’ll see flower vendors, sketch artists, human statues, and random spectacles of breakdancers. One of the most popular Barcelona tourist attractions on this street is the food market, La Boqueria. At the end of Las Ramblas the Christopher Columbus monument, which you can go up in an elevator for 6 euros. 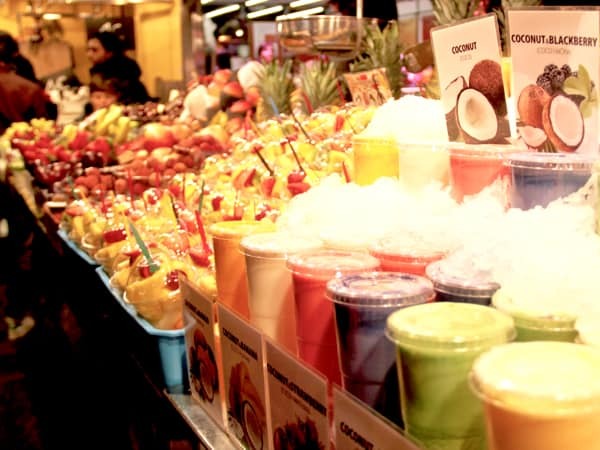 La Boqueria, also called the Sant Josep Mercat de la Boqueria, is the most famous food market in Barcelona. It’s fascinating to visit to see the impeccable displays of fruit kabobs, fruit structures, and jamon serrano (Spanish cured ham) served in a paper cone. But know that a lot of the displays are “for tourists” i.e. lots of them aren’t even local produce! Go towards the back to get a better idea of what the market is really like, where local grandmas are choosing their solomillo cuts of meat, or ordering ham bones to prepare a slow-cooked meat broth. Note on visiting La Boqueria: a few years ago, the absurd amounts of tourists – combined with these tourists treating the market like a free-for-all museum – sparked protest among the local shoppers and vendors. Understandable, right? So if you like to wander like I do and take photos, be sure to ask before snapping pics up close. Buying something helps too! I like to indulge in a 1.50 euros smoothie. 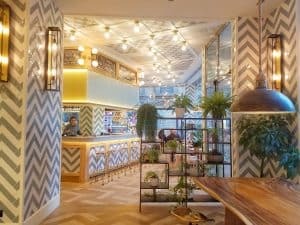 Alternative: If you don’t go to La Boqueria, Barcelona has other richly visual food markets – and are some of the best places to visit in Barcelona for an authentic experience of local life. The one nearby my home is undisturbed by tourists but has a wide array of locally sourced foods and restaurants and bars. Try the local Santa Caterina market, or the newly renovated, Sant Antoni market for architectural gems. All of the food markets are beautiful and a feast for the eyes! 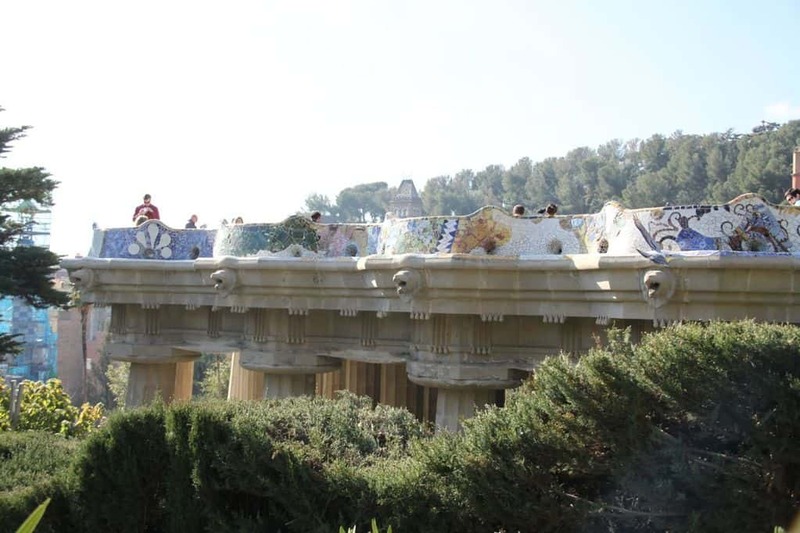 Art imitates nature, and nature imitates art, according to Park Guell’s design genius, Antoni Gaudí. Natural materials make beautiful, organic structures where rock ceilings whirl upward around like tornado spirals, diagonal pillars support tilted walkways, and a curvaceous bench imitates a sea serpent. The colorful tile work, wavy buildings and paths, and gorgeous views of the city make it a fun, playful place for everyone. Spend at least an hour here and try not to Instagram a photo. Also, it’s worth coming here for the views! Parc Guell, a playground for kids and adults. You’ve got to pay to get this view. Barcelona has over 4.5 kilometers of beaches. And did you know, there was no beach in Barcelona before the 1992 Olympics? 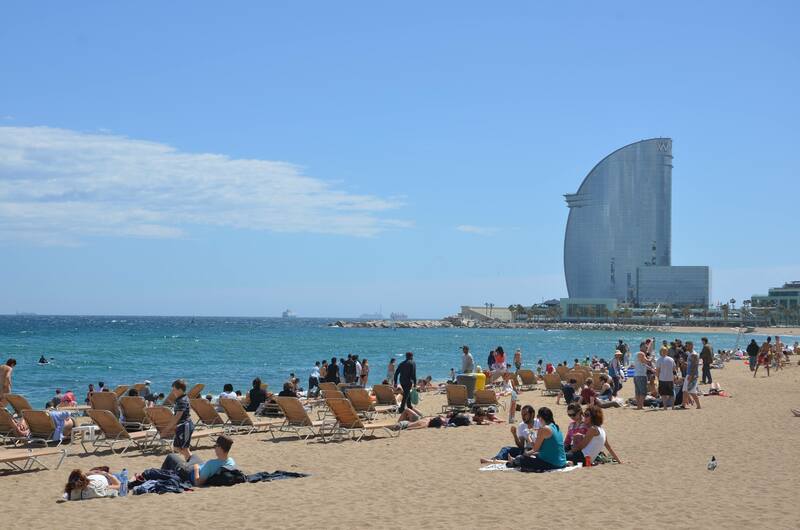 One of the most popular beaches is La Barceloneta. It’s fun to see (but in my honest opinion, it’s chaotic and overcrowded). 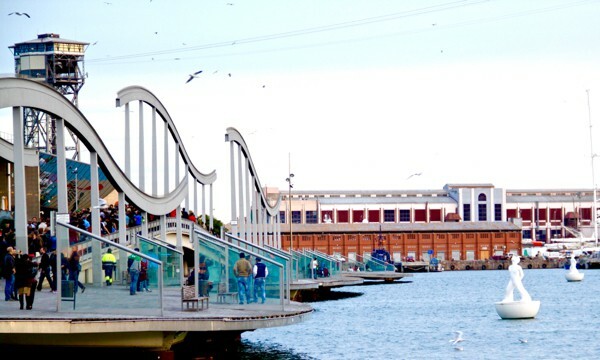 The Barcelona seaside is a huge draw for tourists, particularly it’s sandy beaches, bustling Port Olímpic, or Port Vell. Cross the bridge, the Rambla de Mar. Sand + sun: the beaches are one of the hip places to see in Barcelona. 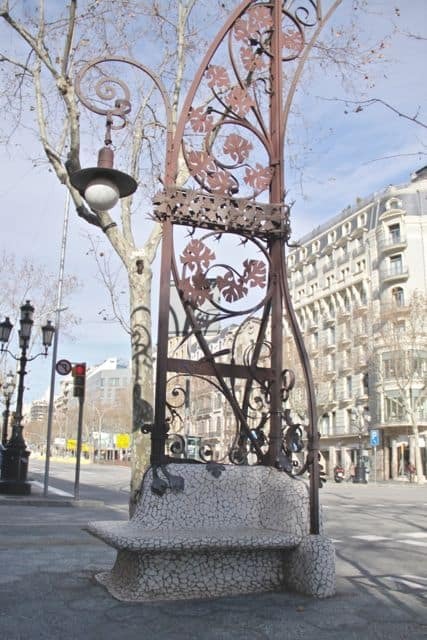 In 1860, the city of Barcelona expanded beyond the Cuitat Vella, and voila the beautiful Passeig de Gracia was built. This is where you’ll find elegant modernist buildings lined with trees and streetlight-benches made of trencadís, beautifully broken tilework. The most beautiful streetlight-bench in the world? You decide. Around Carrer Consell de Cent is a famous cluster of modernist buildings called the Manzana de la Discordia, three sets of buildings designed by different architects such as the Casa Lleó Morera, Casa Amatller (which has a beautiful chocolate shop inside), and of course the Casa Batlló designed by Antoni Gaudí. Casa Batlló. Like the Eiffel Tower, people used to scoff at this “ugly” building. Fun fact: there are no 90º angles in this building. I dare you to find one! 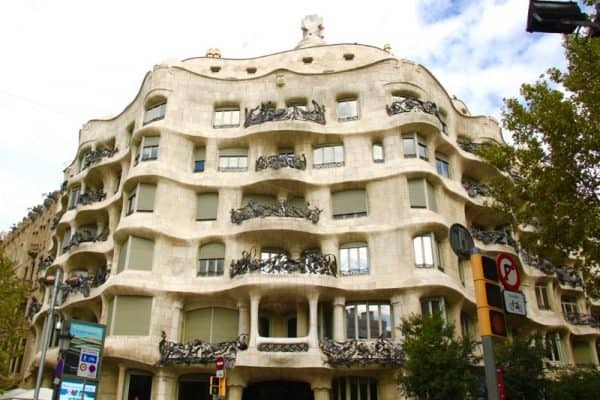 Walk towards Carrer Provença, and you’ll also come across the Casa Milà, also called La Pedrera. A UNESCO Heritage site, this residential building was constructed between 1906 and 1912, and has wavy shapes, iron balconies, and medieval warrior chimneys on its rooftop. As you walk away from Plaça Catalunya (towards Gràcia), there’s a hidden gem on the Passeig de Grácia. 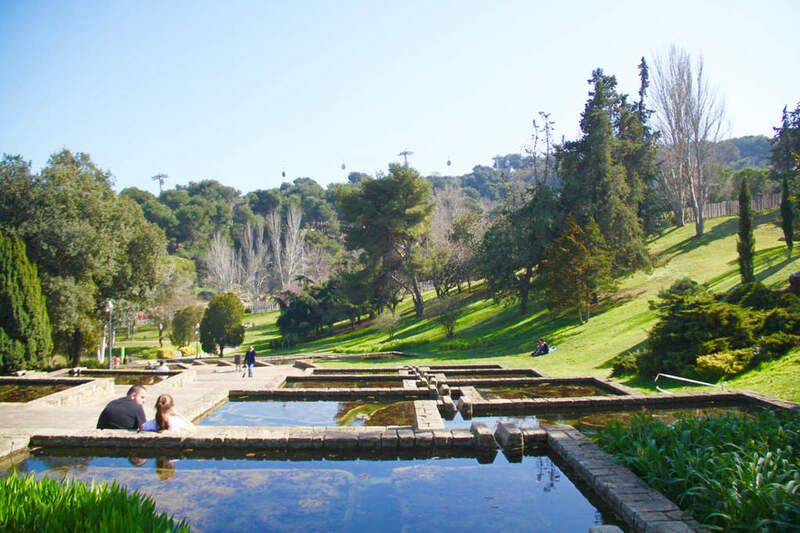 It’s the neoclassic Palau Robert, a mansion constructed in the 14th century with a peaceful garden in the back, perfect for taking a quick break of Barcelona sightseeing. Last but not least, Passeig the Gracia as one of best shopping places in Barcelona as well, where you’ll find flagship stores of Chanel, Gucci, Nike, Jimmy Choo, and more mid- to upscale brands and restaurants. To catch some altitude and see Barcelona from above, head to Montjuic. You can start from the Plaça Espanya (metro stop: Plaça Espanya) and walk down Avinguda de la Reina María Cristina towards the Museum of National Art of Catalunya (MNAC). Climb up some steps (with the help of a few escalators) to reach the museum. From there, you can get a nice view of Plaça Espanya! Alternatively, head to the Montjuic Castle for some panoramic views! From the Parallel stop on the green line (L3), can have a mini-adventure on the funicular to reach Montjuic, an expansive hilly area with beautiful panoramic city views. The MNAC museum, Poble Espanyol, and the Olympic Stadium are all located here, although they’re spread out. There’s also enough room to stretch your arms and find a quiet place for an afternoon siesta. Whatever you do, don’t just wing it as you’re hungry because you may be sorry. Case in point, some visiting relatives of mine decided to eat at La Boqueria at a bar there because it looked good. They were stiffed with a 40 euro bill – for breakfast! Ouch. See my map of recommended places to eat. Or book a food tour! If you’ve never been on one, they’re a great way to try the local Catalan food, experience unique eating rituals, and understand the history behind the gastronomy. I recommend Eye on Food Tours Barcelona. They’re a fun company that knows their food and history. It’s a food tour with the perks of learning history. Or a history tour with the perks of eating food! Book your food and history tour with Eye on Food Tours. I promise you won’t regret it. I wasn’t sure if this is a “must do in Barcelona”…but why not? Maybe I’m biased towards fried dough that’s sprinkled with sugar. But come on, I can’t be alone on this! One of the fun things to do in Barcelona is to eat dessert! Note that oftentimes the hot chocolate is almost like a melted, unsweetened semi-dark chocolate bar. Yup – unsweetened, which is why they give you 2 packets of sugar with it! 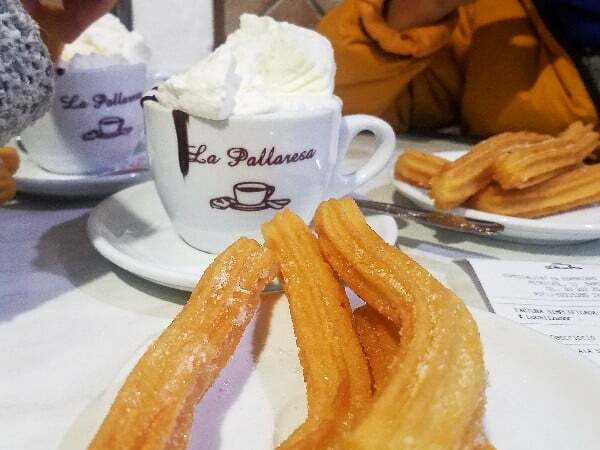 If you have churros, often the sugar in the churros is enough to make the blended delicacy sweet. Kids may not like it because it could be too thick and dark. That means you could lick up their share bwahahaha! Try La Pallaresa, Granja Viader, or La Nena in Gràcia. Don’t get robbed. 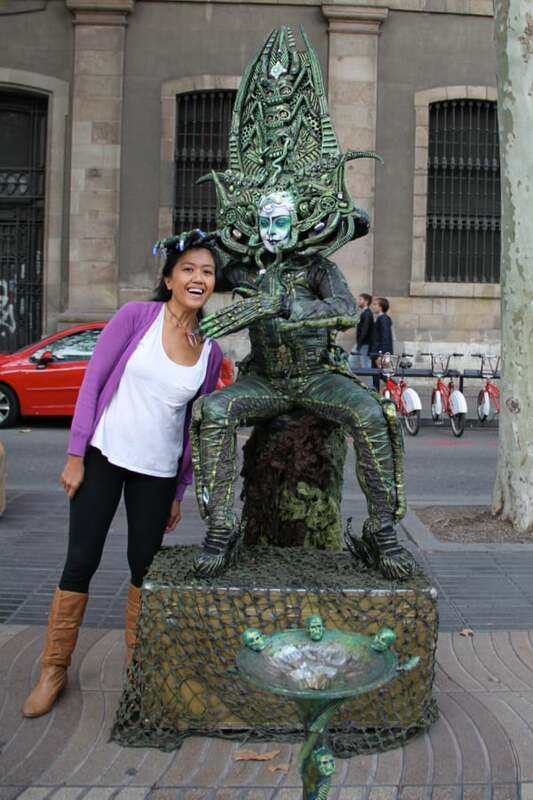 When you’re hanging around the Barcelona tourist sights, be very mindful of your wallet and/or purse. Summertime is prime time when pickpockets prey on tourists, although it happens year-round. Sadly, if your stuff gets stolen, it’s unlikely that the police will care that much if you report the theft. 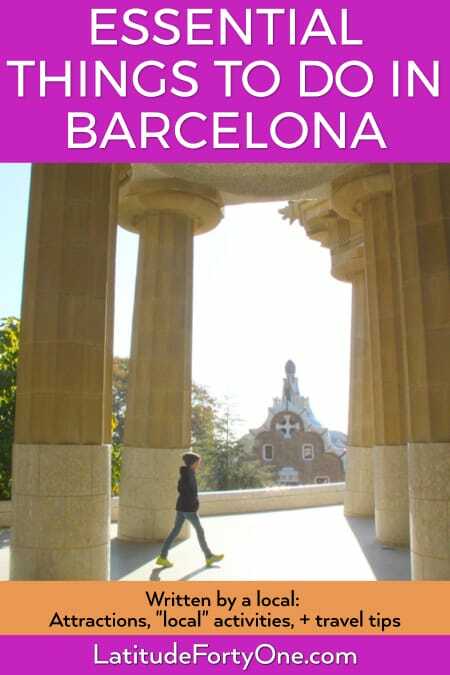 To get around Barcelona, the cheapest and easiest way to get around is using a T-10 ticket. You can buy it at metro and tram stops. It’s valid for the metro, bus, and tram. Public transportation works smoothly here, so you won’t have any problems getting around. At night, the metro closes except for Saturday nights when it runs all night. Catalan is the official local language in Barcelona, although Spanish (also called castellano) is spoken widely as well. I can’t speak Catalan, although I understand it. English is not as universal here as it is in other parts of Europe, but you’ll be able to get by as a tourist. In general, Barcelona is a safe city to travel for solo women. Just practice common sense – don’t go down dark streets, don’t drink too much if you’re by yourself, don’t flash your boobies (oh wait…). The only neighborhood to practice extra precaution is El Raval. While some call it hip, cool, and up-and-coming, there are still some shady areas of drug wars, prostitution, etc. Daytime is perfectly fine to visit – just note it’s “gritty”. The tourist crowds are incredible in the summer. Getting that perfect shot off Park Guell is pretty cutthroat. Be prepared for that. As I mentioned above, buy your tickets to Sagrada Familia, Park Guell and possibly other Gaudí buildings days ahead. You don’t want to miss out! The problem of traveling here is is choosing the must-see places in Barcelona. Have you been here before? What’s on your “must-see” list? Any questions? hi justine, i’m also from california (socal) and a newbie to your blog. i’ve enjoyed all your posts and so thankful that i stumbled on it in search for anything about barcelona. i will be travelling with my 3 teenage boys to barcelona next week…just a brief 3 nights before we fly to rome as our final destination. how is the weather like there now? should i pack raincoats, wintery coats or just light sweaters for layering? i’d love to know your thoughts and more tips, please. 🙂 thank you! Hi, Lynn! The weather has been gorgeous lately — in the high 60s but sunny. We’ve had sporadic days of rain, so check the weather forecast a day before hand just in case! I wouldn’t pack raincoats…if anything you can buy a cheap umbrella if need be. But yes, dress like an onion and think layers. Maybe a light long-sleeve top, then bring a sweater and light jacket to layer OR just a heavier jacket. A heavier jacket meaning, “wintery” for Southern California weather LOLOL. We don’t wear real winter coats there, right? I know, it’s hard not to want to do it all since everything is so “near”. I do think that Paris for a day is maybe a little crazy, but maybe you like adventure like that! Were you thinking of returning your tickets? If you’ve spent the money and can’t return flight tix (or it’ll be real expensive), I’d say enjoy the ride and do it. If your kids have been itching badly to go there, let them enjoy. But remember that you’ll have jet lag, even if you did sleep on the plane, your mind and body will be out of whack. I just hosted some relatives here, we traveled a lot and were exhausted. But it was still worth it! Thank you for all your thoughtful insights, Justine! I really really appreciate it. In God’s good hands and mercy, we are good to go. I hope we can meet up briefly if your schedule allows it. 🙂 I’ll be reading up your blog the entire night to pick up more tips. 🙂 Please don’t hesitate to share any thoughts that you may have, be it fun or cautionary. I’m all ears. Again, thank you!